20 June 2016 – Washington, DC – In its latest attempt to stifle free speech and expression, the Government of Bahrain has revoked the citizenship of Ayatollah Sheikh Isa Qassim. Sheikh Isa is highly regarded as the spiritual leader of Bahrain’s Shia population, who make up the majority of the country. A Bahrain Ministry of Interior statement said, “he exploited the religious pulpit for political purposes” and aimed to incite violence. This latest development emphasizes the government’s recent trend of reprisals against the political opposition. 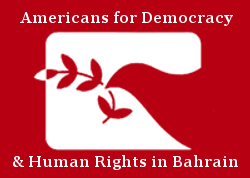 Americans for Democracy & Human Rights in Bahrain, the Bahrain Institute for Rights and Democracy, Justice Human Rights Organization and the European Centre for Democracy & Human Rights unequivocally condemn the government’s actions against Sheikh Isa Qassim, and demand the immediate reinstatement of his citizenship. Sheikh Isa is not only a highly regarded cleric, he has also been a vocal opponent of the Government of Bahrain. He was an integral opposition figure during the 2011 protests. The cleric has also long demonstrated his criticism of the Bahraini government as a leader in the subsequent pro-democracy movement. Sheikh Isa Qassim is the latest victim of the Bahraini government’s systematic revoking of citizenship. To date, Bahraini authorities have stripped over 300 people of their citizenship, many of whom are human rights defenders, political activists, journalists, academics, and religious scholars. The vast majority of persons denaturalized in this fashion have been Shia. This ongoing practice is an affront to international human rights standards. Many whose citizenship is revoked are rendered stateless and subsequently deported from Bahrain. Shortly after the news of Sheikh Isa Qassim’s denaturalization broke, Bahraini citizens took to the streets near his house. Demonstrating their anger and frustration, they have flooded the area chanting and holding signs with Sheikh Isa’s photograph. Further demonstrating the Bahraini government’s lack of regard for human rights, Qassim’s citizenship revocation comes days after the Bahraini government suspended the country’s largest political society and opposition group, al-Wefaq. Al-Wefaq’s political leader, Sheikh Ali Salman, is currently in prison. His sentence was recently increased from four to nine years as a previous not-guilty verdict was overturned upon appeal. Enacting reprisals against its opponents has long been a staple practice of the Bahraini government. The international community needs to address Bahrain’s flagrant attempts to silence its opposition and its citizens. By revoking Sheikh Isa’s citizenship, the Bahraini government is further signaling to its populace, and the world at large, that it will stop at nothing to root out and render its opposition obsolete. The Government of Bahrain continues to violate human rights and stifle its citizens to achieve these goals and maintain its own power. We call on the international community, including the United States and the United Kingdom, to make it clear to Bahraini authorities that systemic repression will not be tolerated, and that engaging in widespread and naked human rights abuses will have long-term consequences for years to come.